Five years after the finances of the Archdiocese of Philadelphia appeared as bleak as they’d ever been in its 200-year history, the turnaround that began in 2012 continues to show improved results. 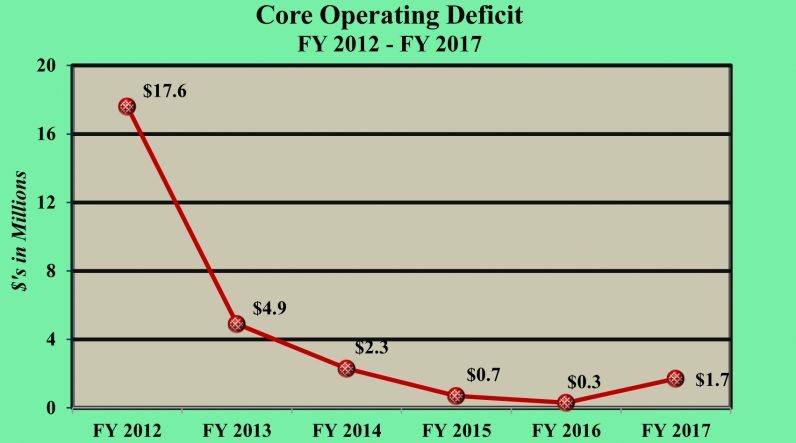 New audited financial statements for the archdiocese’s Office for Financial Services released Monday, Nov. 13 for the 2017 fiscal year ended June 30 show a rise in the core operating deficit to $1.7 million, up from last year’s deficit of $300,000. The rise was not unexpected, and archdiocesan officials, according to an explanation of the statements, took actions to “achieve a sustainable break-even or better result” for core operations in the current fiscal year that will end June 30, 2018. It is a dramatic reversal of the $17.6 million core operating deficit in 2012 that necessitated layoffs of about a quarter of the archdiocese’s workforce and the leasing or sale of church property that continues today. Perhaps more significant than the accounting books’ march into the black is the improvement in the long-term liabilities of the archdiocese. The four “balance sheet obligations” including the Deposit and Loan Program, Risk Insurance Trust, Lay Employees’ Retirement Plan (LERP) and priests retirement plans collectively were underfunded by a whopping $354.4 million in 2012. By last June 30, according to the audited financial statements, the obligations were underfunded by $141.1 million — that is a positive swing of $213.3 million in five years. The retirement plans for archdiocesan priests, in fact, are overfunded at a healthy $6.1 million and the risk insurance program by $500,000. The Deposit and Loan Program, whereby archdiocesan parishes deposit money and earn interest so that like a bank the money may be loaned to other parishes for their needs, remains underfunded at $36.7 million, an improvement from $82 million in 2012. The archdiocese intends to fund the program fully with proceeds from the sale of two properties in Delaware and Chester counties. The LERP remains underfunded by $111 million, an improvement from the $151 million it had been underfunded in 2012. That defined benefit retirement plan was frozen in 2014 as the archdiocese transitioned lay employees to a 401k-style defined contribution plan (a 403b plan). Continued improvement to the LERP, so that it is fully funded to meet the needs of future retirees enrolled in it, was helped by two unplanned contributions by the archdiocese of $30 million in the 2017 fiscal year, on top of $7.5 million in fiscal 2016. Also, the funding rate from “pension-eligible payroll” was increased in fiscal 2017 to 5.9 percent from 4 percent. With the new rate, and if “all other actuarial assumptions are achieved, the plan should be fully funded in approximately 15 years,” according to the archdiocese’s explanatory narrative. Archdiocesan officials point to improved revenue collection from parishes and continued efforts to hold the line on expenses as reasons for the improved health of archdiocesan finances over the previous five fiscal years. As the financial statements audited by the accounting firm Grant Thornton show, parish assessments of $19.15 million were nearly identical to fiscal year 2016’s $19.16 million. But parishioner support in the form of collections, bequests and donations was up to $1.71 million from the previous year’s $1.13 million. Reflecting the strengthened national economy, income from investment interest also improved to $1.08 million in FY 2017 from $896,000 in the previous year. Overall for FY 2017, revenues of $109.6 million exceeded expenses of $108.3 million, a slim margin with which to work. After adjusting for non-recurring items, the core deficit of $1.7 million appears manageable and heading in the right direction — to the black, and soon. But that does not mean the archdiocese is remaining stagnant. As the financial statements audited by the accounting firm Grant Thornton show, a one-time expense of $4.5 million was included for costs of renovating the former Our Lady of Ransom School as the new home of the Catholic Historical Research Center of the Archdiocese of Philadelphia. The archdiocese’s ministry to youth and young adults also expanded in the last year through its new Anthem office with a staff of three. In both cases, the funding for the projects came from Catholic Life 2000 — a past fundraising campaign among the faithful of the archdiocese that is supporting the needs of the church today. Under Archbishop Chaput we were able to do this. THANK YOU Bishop. I applaud archbishop Chaput what he did for the School system long term was bold and needed. Cardinals Bevilacqua and Rigali unfortunately played kick the can down the Road. The Parish facilities were antiquated and ubiquitous in Philly. Archbishop Chaput took the bull by the horns and needed to exit unsustainable business due to long term capital infusion of some entities sold off. Black ink but at what cost? Closed parishes, cemeteries and nursing homes sold off, schools closed or tuition out of sight, Catholic school enrollment down. Stop thinking about the bottom line and worry about people! An old nun in grade school told us 2 things: “God will provide” and ” Do thy duty that is best leave unto the Lord the rest!” You wonder where vocations in this AD have gone, they follow the mass decline in Catholic school enrollment!